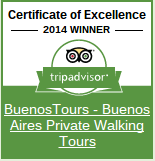 Why Take the Retiro & Recoleta Half Day Private Walking Tour? This tour is the best way to experience the grandest neighborhoods of Buenos Aires and possibly the most remarkable cemetery in the world! The Retiro & Recoleta tour gives you a secret window into the city’s glorious past, which will help you discover why Buenos Aires is often referred to as the “Paris of South America”. “I selected BuenosTours for the half day Recoleta tour… an excellent pick …we concluded with the Recoleta cemetery where history abounds. 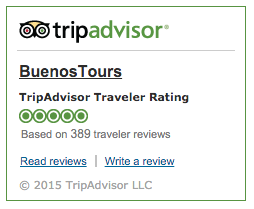 Click Here to Book this Recoleta Tour Now! • The renowned Recoleta Cemetery, a city within a city that boasts the elaborate tombs of Argentina’s rich & famous. A definite “must see”, and one that you’d be lost seeing without an expert guide. • The last resting place of Eva Peron (Evita), perhaps Argentina’s most acclaimed icon, alongside countless hauntingly beautiful mausoleums inside the cemetery walls. • Numerous elegant mansions, built by BA’s wealthiest residents during Argentina’s golden era at the turn of the 20th century, inspired by the finest Parisian architecture of the time. • A midway coffee break at Cafe La Biela, a landmark corner café with over 150 years of history, frequented in the past by race car champions, today a hub for the local elite. • The most upscale boulevard in the city (Avenida Alvear), lined with designer shops and some of the city’s most lucrative real estate. • Plaza Francia, home to the striking Our Lady of Pilar Church, one of the best preserved examples of colonial architecture left standing in Buenos Aires. • The Falklands/Malvinas War Memorial in honor of the victims of the 1982 conflict with the United Kingdom, ironically surrounded by landmarks to the earlier British influence in Argentina. • Plaza San Martin, one of the most beautiful green squares near the heart of the city, with its grand monument to the independence hero of Argentina. • You could choose to extend this tour by 1.5 hours to also take in the most interesting parts of the historical city center. To do so, you would book your tour using this link (instead of the other links elsewhere on this page or the calendar below). There may also be other possible tour extensions, just ask if you have something in mind!